Currently, Sears accepts only specific shipping carriers and their specific methods, so the store owners have to map their BigCommerce carriers with the Sears carriers and their specific methods to ignore the order rejection. The store owner can add the Carrier mapping and delete the mapping those are no more required. In the BigCommerce Carrier column, enter the required carrier name. 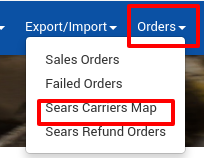 In the Sears Carrier column of the respective row, select the corresponding carrier from the list to map it to the corresponding BigCommerce Carrier. In the Sears Method column of the respective row, select the required Sears method from the list. Click the Add Mapping button to add more carrier names if required. A success message appears on the page. Scroll down to the required carrier row. In the Action column of the respective row, click the Delete button. The respective carrier mapping is deleted and remove from the BigCommerce-Sears Carrier Mapping page.